2. Extract it with winrar or winzip to a folder on the desktop. 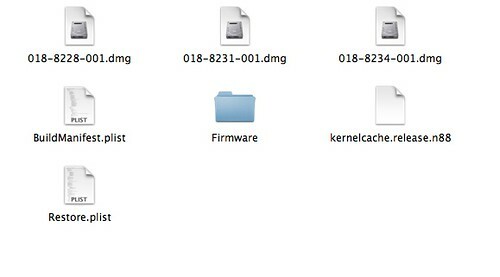 You may need to rename the firmware file from .ipsw to .zip to do this. 4. Download 4.0.2 ipsw and open this with winrar or winzip. Note: do not exact it. Just open it and leave it open. You must use this exact file and not create a new one. If you have to create a new one for reasons like you are on OSX, then use zip command line not explorer or finder to make the zip. I will assume you are using the original file opened in winrar for the rest of this guide. 5. Take all the files from the 4.0.1 and drag them over to the 4.0.2 zip archive that you have open. 6. Delete all the dmg files that have 002 at the end, leaving only the 001 files left. 7. Save the archive. And rename it back to .ipsw if you changed the name to get winrar/winzip to open it. 8. Optional: (this helps ensure you get an shsh file request for the future, but should not be necessary to just restore 4.0.1). Add the 74.208.10.249 gs.apple.com line to the host file. If you need help with this step, read this. 9. Put the device into dfu, open iTunes and restore the firmware you changed. Check out the original post or give thanks to CodeBlue at his blog. Note: this only works due to the similarities in 4.0.2 to 4.0.1 and 4.0. This will not be a way to downgrade to 3.1.x and may not work in future firmware updates.